Are you eager to know about Google Nexus 7, the lightest 7" tablet ever on Earth? Here is the hands on review of Nexus 7 tablet. Read out this article and get you jaws dropped with exclusive review of featured hits, specs, pros, cons and availability of Google Nexus 7 in India. Google Nexus 7 has arrived in Indian market with simplicity, beauty and beyond smartness. This one among all the Nexus brands by Google represents a premium Android-based smart device which not even provides a georgic interface but also offers the best Google experience ever. Nexus 7 is a stunning tablet by Google and is the perfect commute or travel companion in this era. Let's check out what Google shows off in its best launch in India. The name of the tablet reflects its smart display; 7-inch (17.8 cm) HD backlit IPS multi-touch screen display. With such kind of stunning display size, Nexus 7 shows off its HD resolution of 1200 x 800 pixels (216p per inch) onto the touchscreen. Actually the full display screen type of the tablet is Active Matrix TFT Color LCD and In-plane Switching (IPS) Technology, display screen technology. Nexus 7 has many big hits to show in this aspect. It is ASUS built and comes with a NVIDIA Tegra 3 quad-core (4 Core) processor clocked at 1.20 GHz, making it faster in every style. Quick page loading, smooth gameplay and multiple app running are indeed the worth seeing features on the tablet. As Nexus 7 speeds in its functioning, multitasking seems a breeze in regard with its performance and the 4-PLUS-1 patented design offers processing power when needed and works as an efficient battery saver from time to time. For OS platform, Google Nexus 7 has Android and for OS, it has chosen the latest version among all other OS by Android, the Android 4.2 Jelly Bean OS. This version OS provides the more efficiency and performance power to the device. And with it, Google Play Store is meant to follow the device, offering the Nexus 7 users a variety of +700,000 apps and games. Taking about the memory, Nexus 7 has a 1 GB RAM (standard memory), providing a smooth performance in support to the device. The storage capacity of Nexus 7 differs from its variants i.e. the smart tablet comes with many memory variants including 8 GB, 16 and 32 GB variant. So which one to choose and buy, it depends on you. In addition to these, Nexus 7 comes with 1 MB cache. Nexus 7 is available in market with Nakasi Brown color and I tell you, it just suits the good looks and style of the smart tablet. Nexus 7 is not blend, it is thin enough to manage it perfection. All due to what Google wanted to bring before the era; slim, portable device and Jaw dropping device. Yet all know that Google Nexus 7 is a pocket sized tablet and fits perfectly in ones hand. And, you know what? Nexus 7 is the lightest 7-inch tablet in the market today, holding 12 oz (340.0 g approx) weight only! Google Nexus 7 holds the dimensions diagonally equal to 7-inch. It has 10.5 mm of height, 198.5 mm of width and 120.0 mm of depth. The height of the smart tablet reflect it thinness and so on. The dimensions of Nexus 7 provide a typical grasp to its all other features and specs.Along with this, the screen mode of Nexus 7 is WXGA. Let me tell you first that there is no rear camera for Nexus 7. It only supports a 1.2MP front-facing camera with a picturesque location i.e. at the top center side of Nexus 7 (top front). It is intended more likely to be viewed in portrait style. The camera is entirely covered by Corning Glass, adding a tough layer over its original Corning Gorilla Glass layer. Nexus 7 is equipped with a high-tech and highly powered battery, enabling less charging and more doing feature. It provides an 8 hours, 10 hours and 300 hours battery backup while watching HD videos, web browsing and standby time, respectively. Recently, Google launched its Nexus 7 in India. It prices quite different at different retail websites like you can shop Google Nexus 7 at eBuyer (£ 189.99, ASDA.com (£ 199)JohnLewis.com (£ 199) and Amazon.com (£ 217). This isn't yet the end. 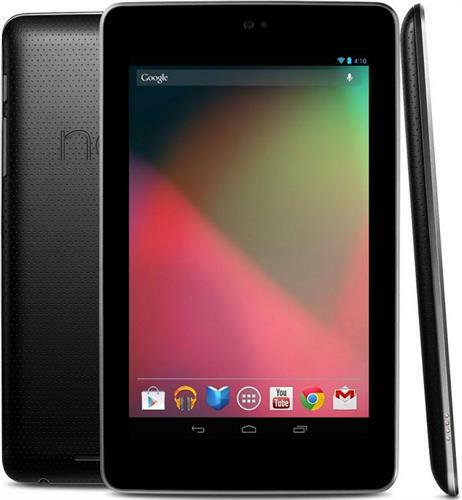 You can also shop Google Nexus 7 at Google Play Store for Rs 15,999 (16K). It ships soon! In addition to above mentioned features and specs, Nexus 7 is Bluetooth and WI-Fi enabled. GPS is also included in it. T30L processor model, ULP GeForce graphics controller model, Slate form factor, IEEE 802.11b/g/n WI-Fi standard and shared memory accessibility are some other jaw dropping features included in Nexus 7 tablet. Nexus 7 doesn't include cables and headset in its package content. Only Nexus 7 Tablet and AC Adapter is included. 1. Android 4.2 Jelly Bean OS. 2. NVIDIA Tegra 3 quad-core (4 Core) processor. 4. 7-inch HD backlit IPS multi-touch screen display. 5. 1200 x 800 pixel resolution. 6. Next generation 4-PLUS-1 design. 7. 1 GB standard memory (RAM). 8. 8 GB, 16 and 32GB memory (storage) variants. 10. 10.5 mm, 198.5 mm and 120.0 mm of height, width and depth respectively. 11. 340 grams of weight (12 oz approx). 14. Bluetooth, WI-Fi and GPS services. 2. Android 4.2, latest version OS. 4. Bundled with countless number of freebies from Google Play Store. 6. Lightest 7" tablet ever. 1. IPS display contrast is quite low. 2. No expandable storage option. 3. Headset not included in the content box.